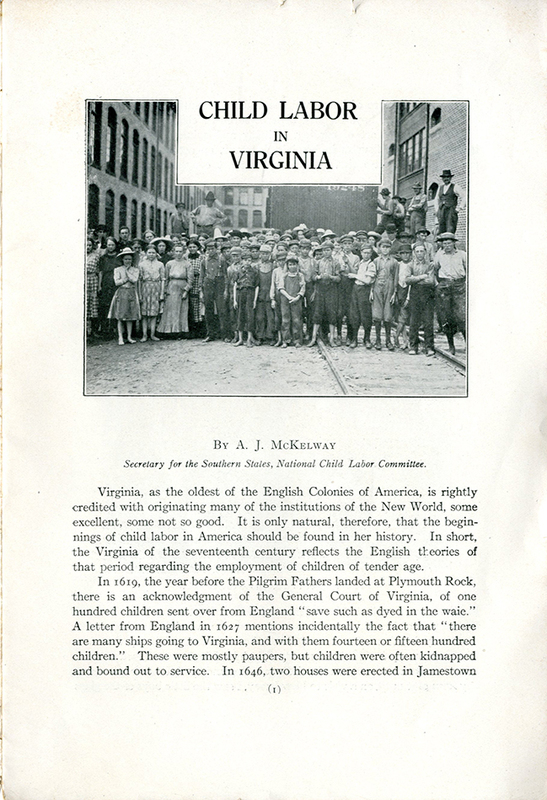 Pamphlet by Alexander Jeffrey McKelway, Secretary for the Southern States, National Child Labor Committee. 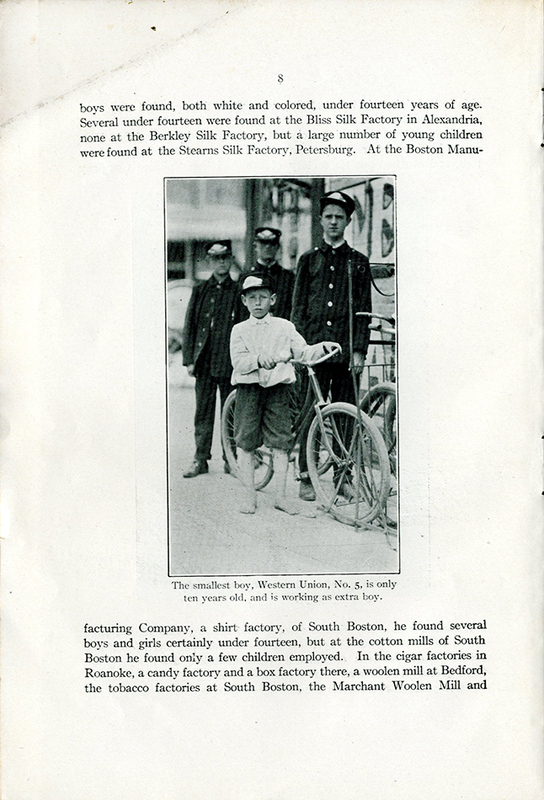 With photographs by Lewis W. Hine, staff photographer for the NCLC. 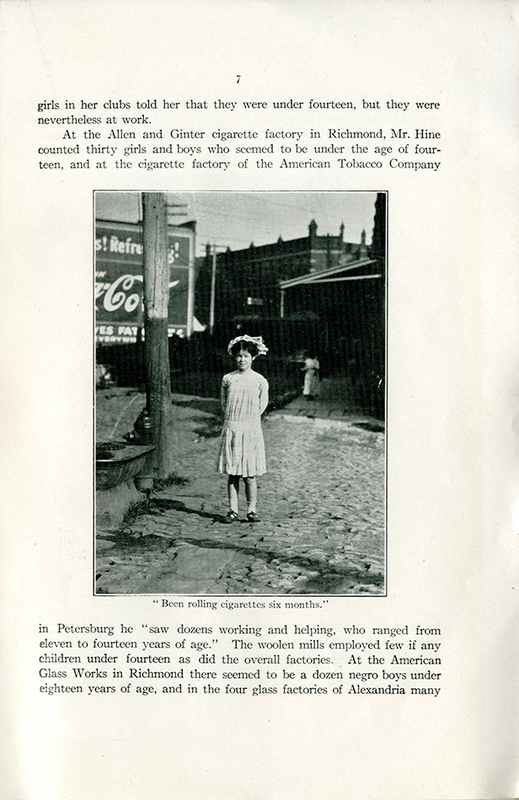 Lewis Hine made a photographic investigation of child labor in Virginia in May and June of 1911. 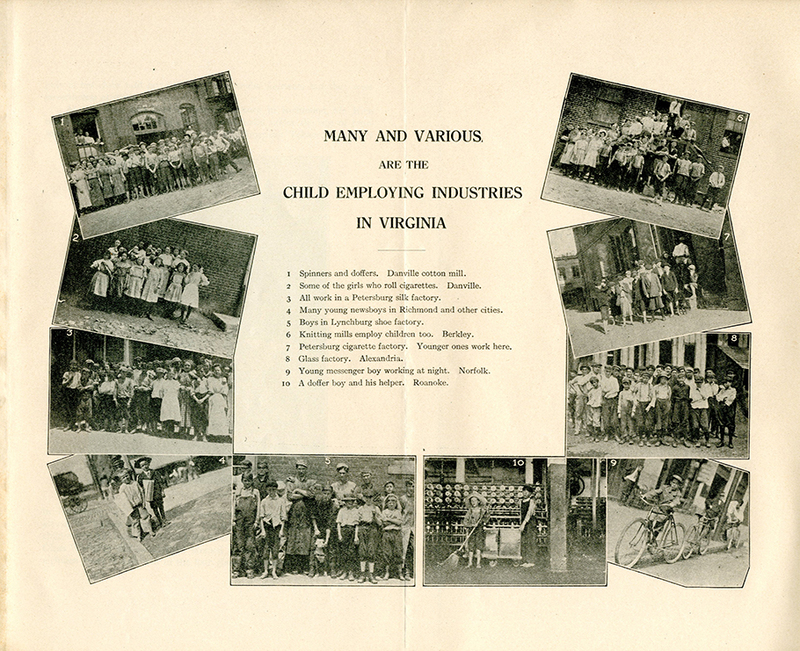 This pamphlet discusses the extent of child labor in the state where children were employed in cotton, silk and knitting mills, coal mines, cigarette factories, glass factories, shoe factories, and as newsboys, messenger boys, and actors on stage. 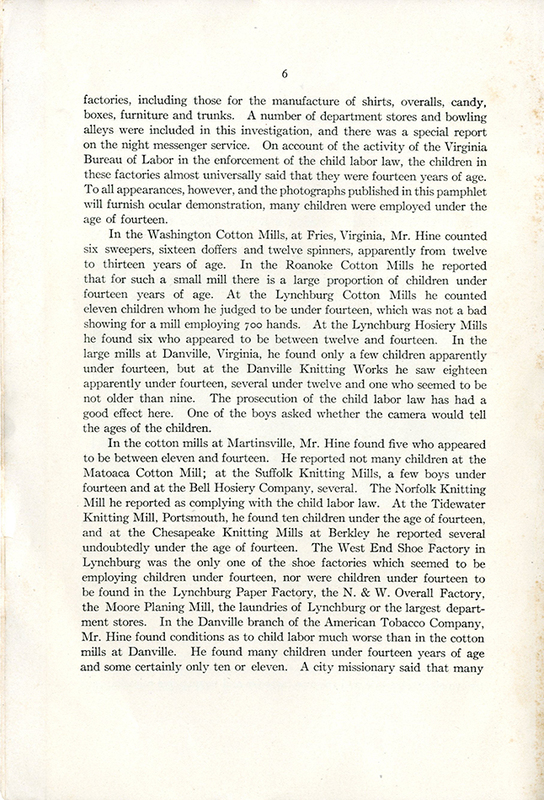 p.3-4 "The cotton mills have often put themselves forward as patrons of education. 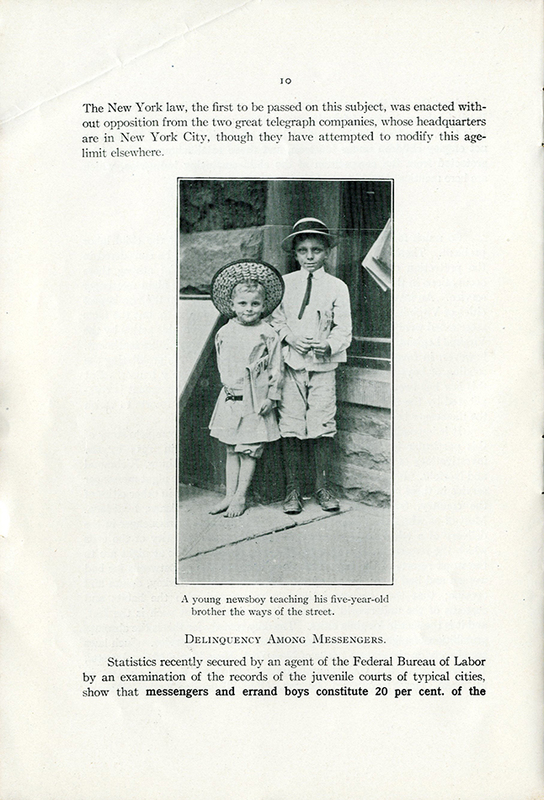 The figures of the Federal Bureau of Labor do not bear out this claim. 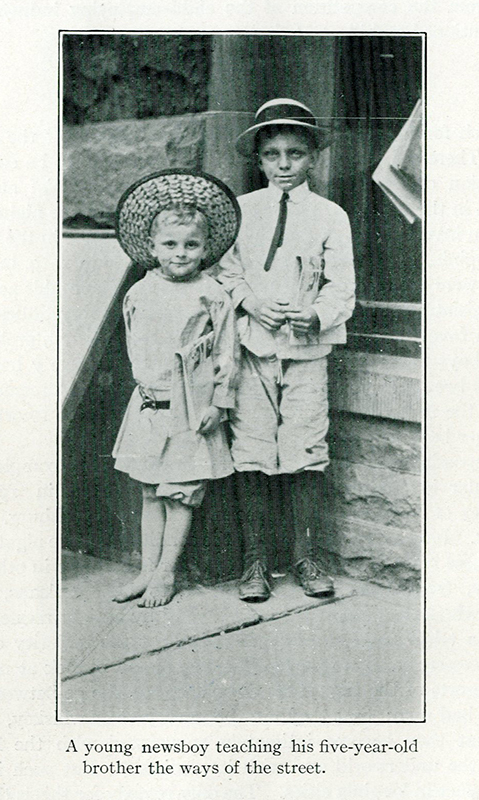 The Census shows that 9 per cent. 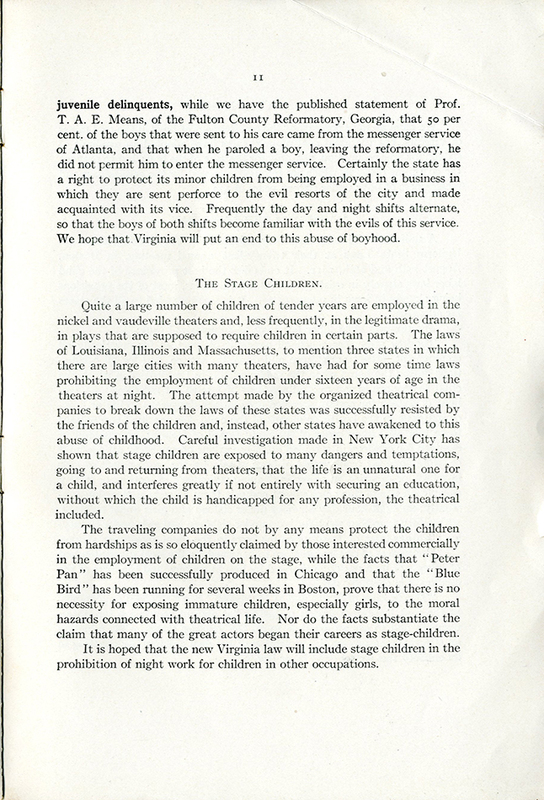 of the white children ten to fourteen years of age throughout the state are illiterate. 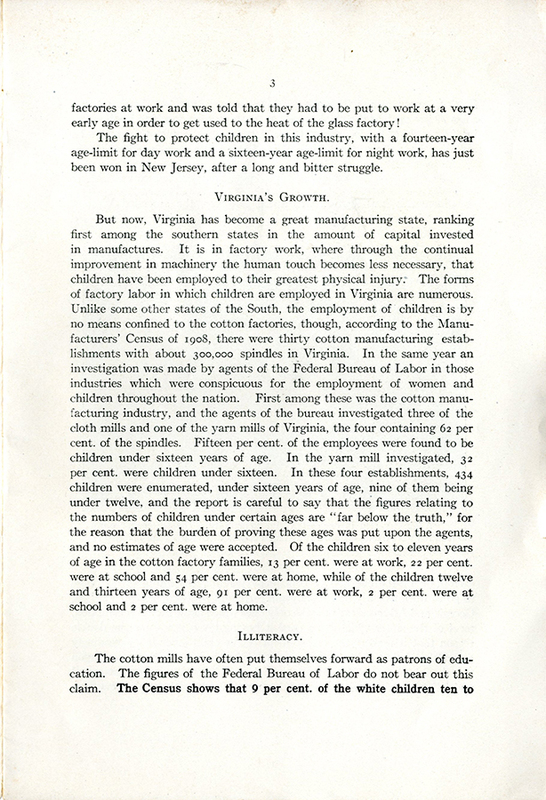 In the cotton mills 70 per cent. 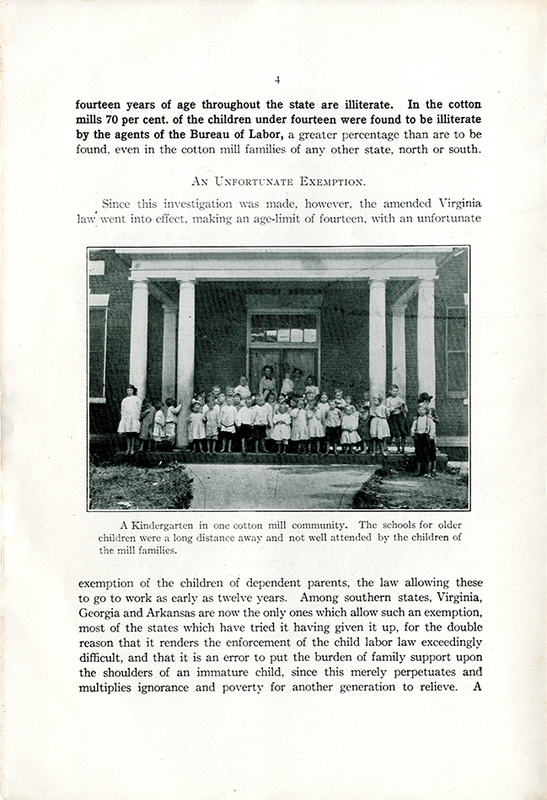 of the children under fourteen were found to be illiterate by the agents of the Bureau of Labor, a greater percentage than are to be found, even in the cotton mill families of any other state, north or south." 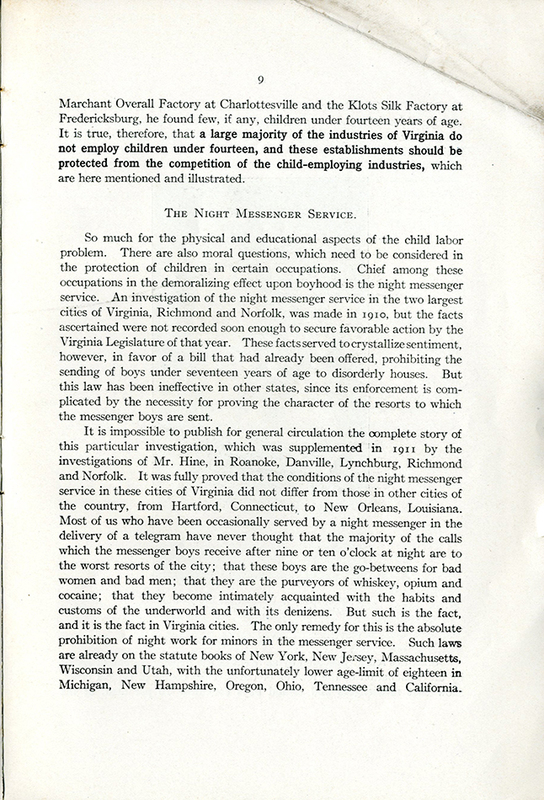 p.5 "...there was no necessity for the labor of these children under fourteen; while it is admitted by all philanthropic agencies that even if there were in individual cases such need, the last expedient that should be adopted is the putting of the burden of family support upon the shoulders of the immature child." 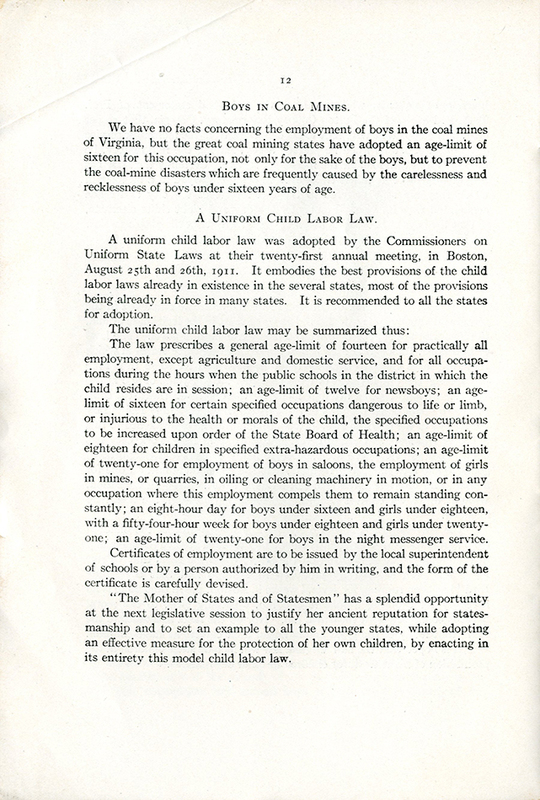 p. 9 "It is true, therefore, that a large majority of the industries of Virginia do not employ children under fourteen, and these establishments should be protected from the competition of the child-employing industries, which are here mentioned and illustrated." 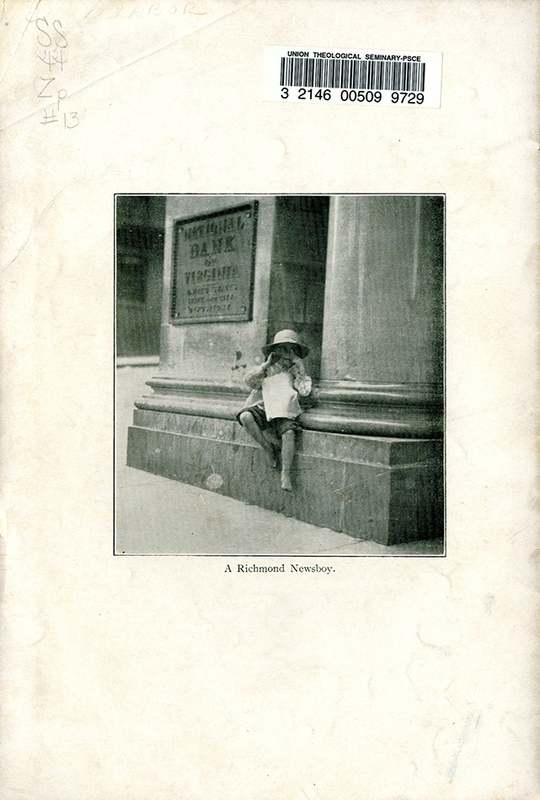 Alexander Jeffrey McKelway, 1866-1918, Documenting the American South. 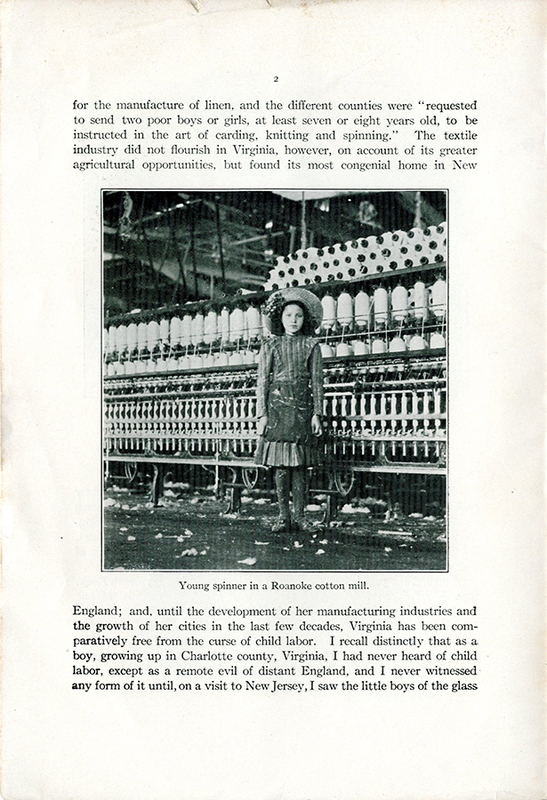 From Dictionary of North Carolina Biography edited by William S. Powell. 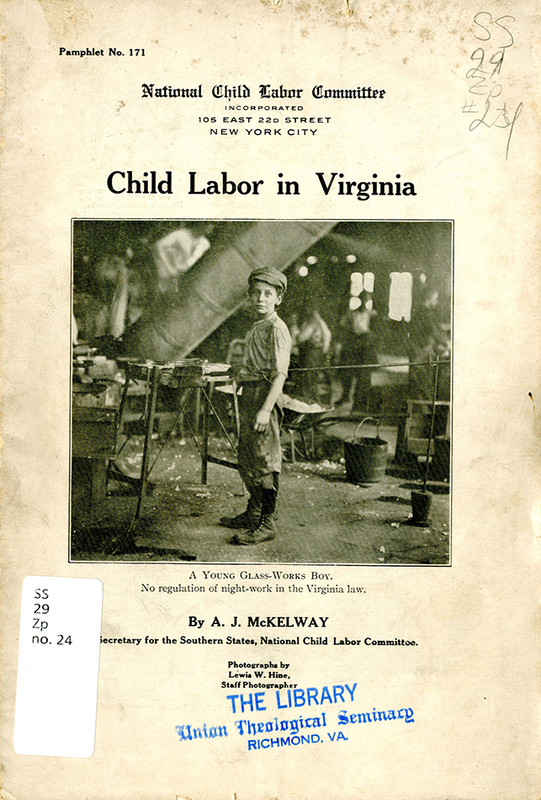 McKelway, A. J. , “Child Labor in Virginia. 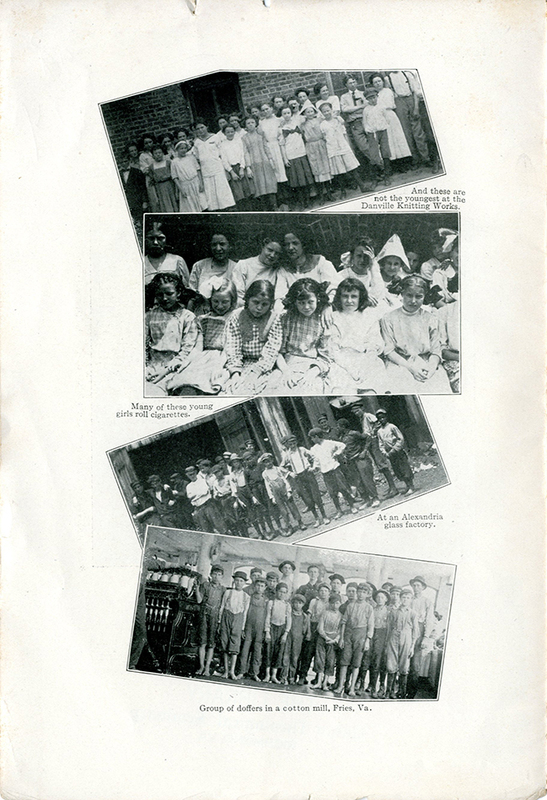 NCLC Pamphlet No. 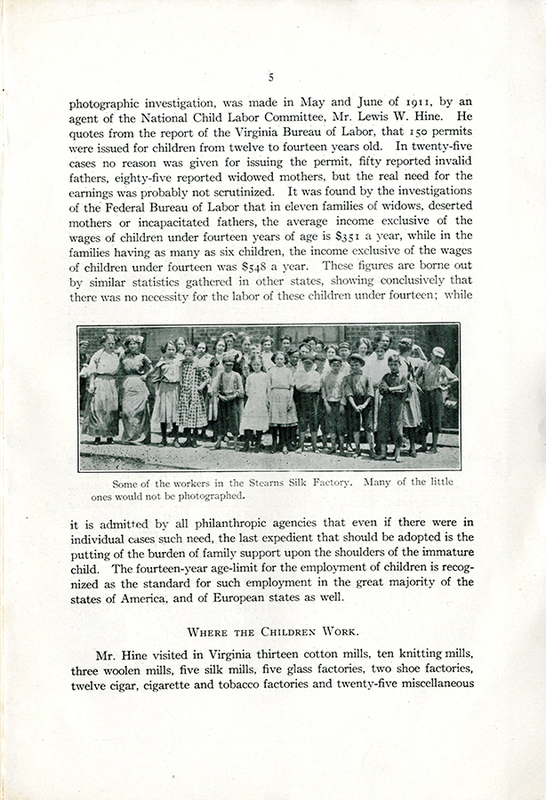 171,” Social Welfare History Image Portal, accessed April 26, 2019, https://images.socialwelfare.library.vcu.edu/items/show/319.